It’s never been my style to do things the easy way, not that I ever really give myself the chance. It took me 7 years, 5 different majors, 3 school, and 3 gap semesters to graduate university. I rarely walk the quickest way home, I always opt for the one that offers potential for misadventure. And I have been known to do stupid things like take a scooter down Africa when I could really have done it the somewhat easier way. When it comes to scuba diving, I have spent time in places like Honduras and Belize all with brilliant blue warm waters, and ample opportunities to learn. But today, somehow, I find myself up in Jasper at about 1100m above sea level with a scuba mask on dunking my head into a lake at the base of a mountain. Such a strange sight as a man in a scuba mask watching elk grazing has never been witnessed. Despite my obvious apprehensions towards swimming around in a lake nestled in the Canadian Rockies, the experience is brilliant. And with a 7mm wetsuit on, the water actually feels refreshing rather than cold. When I’m neck deep, I feel completely comfortable. In time, I find myself hovering below the surface in a strange state of neither sinking nor floating. Perfect buoyancy feels like I imagine flight: no effort, just a bit of a kick and you are propelled forward. Little fish dance around not worried enough to escape, and if I didn’t have to concentrate on my breathing I’d be shrieking calls of adrenaline-driven joy. And well I’m not going to get into too much detail about getting my PADI Scuba Diving certificate in Jasper since I’m going to be writing a feature on it in the next issue of Vagabundo Magazine, I will tell you what to expect. Clear Water: I was blown away by how clear the water was. Generally, when you see Canadian glacial waters they look bright blue. The reason Canadian lakes look so blue is because there is so much rock flour in them. Basically, rock flour is rock sediment ground up by moving glaciers. It gives a milky colour like flour in a bowl of water would. Thus, with all this sediment in the water, you’d expect them to be cloudy. But, as I mentioned above, Patricia gets most of its water from the rains, so it’s much clearer. Visibility under there was probably around 10m or so. 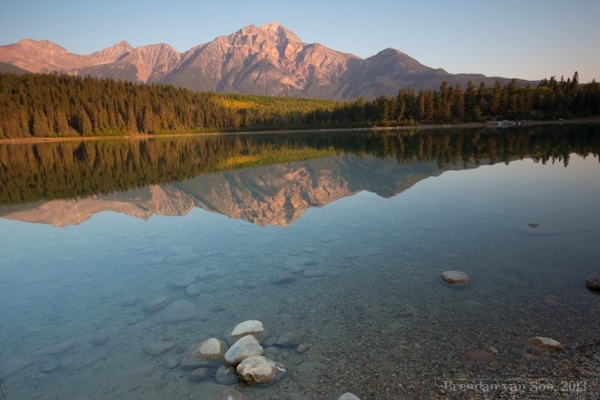 To be in Good Hands: The staff at the dive center at Patricia Lake Bungalows is amazing. They have been diving these waters for years, and are a family run company. And because it’s a bit more rare to dive here, you’ll get very personalized training. Unlike large group school in places like the Caribbean, you’ll likely be in a small group, or alone here in Jasper. To be Blown Away: Not literally of course, but diving in a lake like this is such a unique experience. You’ll find different varieties of fish, and vegetation under these waters. Moreover, there’s actually an old sunken ship here from a top secret WWII project. All of this is well worth checking out. All-in-all, this was one of the best experiences I’ve had in travel. I was so jacked up after my first day in the lake I got into my Pyramid Lakes Resort hotel room and was bouncing off the walls with adrenaline. I can’t wait to get another chance to float around under the water, and I can’t wait for you all to get to read this story in the next issue of Vagabundo (due out in January). Very interesting! So far my diving experience has been limited to Asia, though you’d be surprised how cold the water here can get—diving at an island off of Bali in August, we had to use 5mm wetsuits and it was still a bit brisk! I’ve never though much about fresh water diving, and even less about diving in Canada. I had heard that when you get to dive in glacial runoff (like in Iceland) the visibility and colors are out of this world. Open waters somehow terrify me, which is why I don’t like snorkeling and have never done diving so far. I think I’d enjoy diving in a lake much more actually, as I wouldn’t be scared of man-eating fish in there. I cannot wait to learn to scuba dive! Or at least just do it for the first time. Even though when I think diving, I think Asia or something, I feel like any destination has the potential to be really phenomenal given the chance and the right conditions. Like this. Scuba diving really is amazing. I was surprised at how effort free it is, so easy! Very interesting, i really appreciate the way you describe this content. I’ve never though much about fresh water diving, and even less about diving. Further it motivates me to learn about scuba diving.